Earlier this month, a group of three young Bahrainis arrived in Washington to talk about reform in the small Persian Gulf nation, which has been rocked by Arab Spring protests for the last year. The delegation, including an NGO worker and a tech entrepreneur, both Western-educated, represented “the leading voice for change and reform” in Bahrain, as an email message from one of the group’s representatives put it. But these weren’t leaders of the protest movement that has challenged the country’s ruling Sunni monarchy. They were members of a “youth delegation” put together by a top American public relations firm, Qorvis, which has been working with Bahrain to shore up the country’s image in the United States. The youth delegation’s modestly pro-reform message was mixed with sharp criticism of the opposition in Bahrain and complaints about negative media coverage in the U.S.
Last year, in the early weeks of Bahrain’s violent crackdown on the largely Shia opposition protests, the minister of foreign affairs inked a contract with Qorvis to provide public-relations services for $40,000 per month, plus expenses. One of the largest PR and lobbying firms in Washington, Qorvis employs a number of former top Capitol Hill staffers and also works for Bahrain’s close ally, Saudi Arabia. The firm’s work for Bahrain came under scrutiny last year when it defended the government’s raid last year on a Doctors Without Borders office in Bahrain. Also in 2011, a Qorvis official wrote pro-regime columns in The Huffington Post without revealing his affiliation with Qorvis. Bahrain is an important American ally in the gulf, and its capital Manama is home to the U.S. Navy’s 5th Fleet. An independent commission found late last year that the government had systematically tortured detainees and used excessive force to put down the protests. 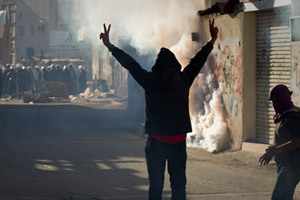 While the unrest has fallen from the headlines, Bahrain continues to suppress protests, sometimes violently. And while Bahrain has promised reforms, Human Rights Watch today released a report finding “egregious violations of fair trial rights” in cases brought against opposition activists. The Obama administration has largely stood by Bahrain, offering muted criticism while continuing to sell arms to the government, though one weapons package remains on hold. To counter negative press, Bahrain has made a major public-relations push in the U.S., employing Qorvis and several other firms. The youth delegation dispatched to Washington, on the anniversary of the start of the protests, is the latest part of that effort. In meetings and public appearances, the three-member Qorvis delegation has criticized opposition protesters as violent agitators. The Qorvis-organized group also argued that youth coalitions involved with the opposition “are a fringe group of rioters and vandals,” Bockenfeld said. The Bahrainis in the delegation were all educated in either the United States or Canada, according to their bios. One member founded a tech company that develops web and mobile applications; another works for the Bahrain branch of an NGO called Young Arab Leaders; and the third is a media specialist for the government’s Information Affairs Authority. Qorvis did not respond to our requests for comment. But the delegation instead seemed to focus on criticizing the opposition and decrying American media coverage. Bahar then challenged an official on the panel from the Bahrain Center for Human Rights.